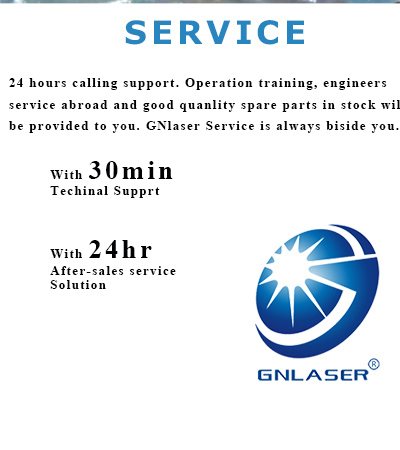 Gnlaser company established in 1999, more than 19 years experience focus on laser machine equipment. We supply professional solution for metal sheet cutting and metal pipe cutting. The sales spread all over more than 40 countries around the world. Wuhan GN Laser Equipment Manufacturing Co., Ltd. is specialized in the research, development, production and marking of profession laser equipment. Our company has an integrative team of many hi-tech elites and experts in mechanism, electronic, industrial automatization and computer software filed. We keep forging ahead actively. We are pioneering and innovative-minded. We provide comprehensive laser application solutions and laser equipment for domestic and foreign customers. We have developed 6 series of more than 10 types of laser products, adopting internationally advanced technology, such as, fiber laser cutting machine, yag laser cutting machine, CO2 laser cutting and engraving machine, metal laser marking machine and so on. Our laser are widely applied in electronic circuit, auto spare part, hardware tool, medical instrument, digital products, apparatus and instrument, optic communication component, packing and printing, etc. Gnlaser products are best-selling in China and other more than 68 foreign countries. Sustaining the management concept of "market-oriented, customer-centric" and taking quality as the core and service as the guarantee, we adhere to the tenet of "talent-oriented, science and technology lead, honesty and trustworthiness, innovation". In the high-speed development of laser application technology, as a sophisticated laser equipment manufacturer in the increasingly fierce industry competition, Wuhan GN Laser Equipment Manufacturing Co., Ltd. is able to provide new and old customers with more advanced and cost-effective laser equipment.